The New Year, New You Hunt is now in full swing at ELEMENTAL JEWELRY! This is an interesting hunt. Each vendor was asked to make a free hunt gift, then two more items that would be on sale. At ELEMENTAL JEWELRY, you can get a free bracelet of silver and purple agate, shown below. For a mere L$50 each, you can complete your set with a tiered pendant and earrings. 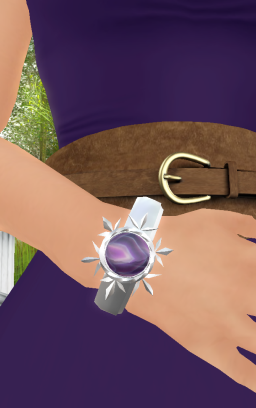 Skin: Style By Kira--Elora skin on sale at Designer Showcase December 30 to Jan 9. Dress: Paper Doll--Charley in Plum, purchased on sale.